If you ever get the chance to go to Quebec City in the summer, you should go! There are so many things going on! Of course, if you want peace and quiet, I would not recommend the Port of Quebec marina but it is certainly right downtown and in the hub of everything. It is hard to believe that in two days, we will be back at home surrounded by trees, rocks and water – no people. I think I will enjoy the quiet but this has definitely been fun! So, last night we could have gone to the marina karoke from 5 to 7 – don’t worry! We didn’t go but it sounded interesting, especially when someone was singing the Love Boat song – yikes! We also could have gone to the Fesitbiere – the beer festival. 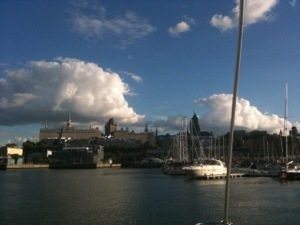 It is right across from the harbour as you can see in the picture below. Or we could have gone to Cirque de Soleil which is in the parking lot where the boat will be stored for the winter. We are going there tomorrow night with Nick. 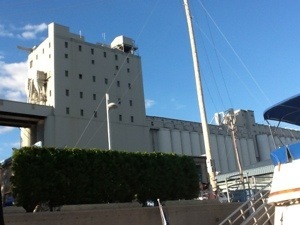 What we did do was row out into the marina’s harbour and watched the giant movie on the grain mill. The following picture was taken from the boat and it was taken to give you an idea of how massive the screen is – 600 metres wide by 30 metres high. 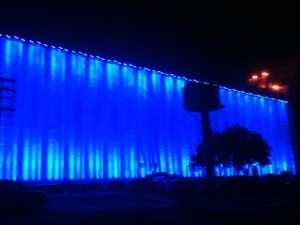 The next picture is of the mill lit up before the show – that was pretty cool already! The show though, was out of this world – an excellent way of presenting the history of Quebec. So, there is a lot to do here. We could have partaken in the Pride Parade today but instead, I dragged Dennis up the hill once again to see the Plains of Abraham. They haven’t changed since 1976 (the last time I saw them). We enjoyed walking on the Promenade and walking through the city. We are just waiting for Nick to arrive. Tomorrow, we are packing the car and on Monday morning, we are leaving at the crack of dawn. It will be a quick ride home (as compared to the trip here!). Hard to believe that the summer is almost over. Have a safe trip home! Looks like Quebec City would be a great place to visit – will need to put it on my bucket list. My list is getting too long…. Lots of fun! Gotta be in shape – lots of stairs and walks going up the hill! We did the parking lot cirque last time I was in Quebec. Phenomenal! If you stand along the white chalk lines you should be front row to see the parade in and pretty good spot to watch the show. After the parade-in people are allowed to move in and forward. Enjoy!